Born in 1975 to a family of musicians, Anait Karpova studied music at the Gnessin School in Moscow in A. F. Arzamanova’s class, then at Moscow State Conservatory where she graduated with honors. She finished her post-graduate studies at the Moscow Conservatory in Professor Merzhanov’s class. At the Brussels Conservatory, she completed a specialisation in chamber music as well as as a soloist with high distinction under the direction of Professors V. Spanoghe and D. Blumenthal. 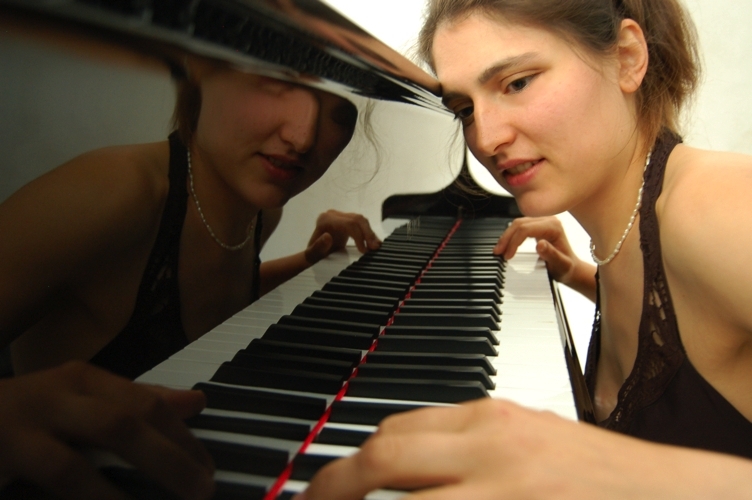 For several years, she has been in the International Certificate for Piano Artists Program with the Ecole Normale de Musique “Alfred Cortot” in Paris (in conjunction wtih University of Florida, College of Fine Arts-School of Music) under the tutelage of Professors N. Delle-Vigne Fabri and Phillippe Entremont. Since 2002, Anait Karpova is a soloist with the Philharmonic Society of Moscow, under the auspices of which she has played with many Russian orchestras. She has performed in most of the concert halls of Moscow, St. Petersburg, Tambov, Penza, Novgorod, Kostroma and other Russian cities, and gives recitals regularly in Belgium (Festival de Wallonie), Holland, Greece, Italy, France and the U.S.A. She has also played with symphony orchestras in Russia, Slovakia (Bratislava) and France (Mérignac, Saint-Emillion). Anait Karpova has recorded for “Radio Classique” a recital with Elena Okolysheva (mezzo-soprano, soloist at Bolshoi Opera) and accompanies sopranos Laura Claycomb and Irina Samoilova in recital. She is regularly taking part at concerts of contemporary music given by “Het Rode Pomp ensemble” in Gent. In 2005 – 2007 she participated at concerts of Hungarian (2005, 2007), American (2005), and Belgian (2006) contemporary music. A recording of Canadian contemporary music is planned in September 2007. Anait Karpova has won many prizes, including the Grand Prix at the Catania International Rachmaninov Festival in Sicily in 2005, the 2nd prize in the Brest International Competition in 2004, The Grand Prix and special prizes at the Médoc Aquitaine Competition in the Mérignac Competition as well as prizes at the Yamaha European Musical Foundation in 1999, the Bratislava Hummel Competition in 1996, the Tambov International Rachmaninov Competition in 1994 and the Moscow National Competition in 1992. Anait Karpova currently divides her time between her home in Belgium and Moscow.